Hello there, and welcome to my review of the Bushnell Tour X Jolt Golf Laser Rangefinder. Bushnell makes a wide variety of rangefinders, so it’s always enjoyable to try out their latest models. The Tour X Jolt may be designed for golf enthusiasts, but it still promises plenty to offer for hunting purposes. Let’s see how well it all shakes out. Unfortunately, the hard carrying case is all I received. That’s not very good when you’re packing for the bush, but at least the whole kit is pretty lightweight. What’s the Range of the Tour X Jolt? This model features ranging capability from five to 1,300 yards, and is accurate to within .5 yard for anything up to 125 yards away. Beyond that, the range falls off to plus or minus one yard. Bear this in mind: the advertised range and accuracy assumes a large, highly reflective target, which a deer isn’t. Expect to be able to pinpoint and get range to a deer from about 500 to 600 yards. How Easy is the Tour X to Use? This rangefinder features single-button operation, which I’m a huge fan of. It’s also pretty simple to use overall, with Bushnell choosing to use interchangeable faceplates to turn slope compensation on or off, saving another menu item to wade through when you’re setting up your device. For a superb image, the Tour X Jolt features fully multicoated optics, maximizing the device’s light transmission and image clarity. The 21mm objective lens also helps to bring in a lot of light. From 1,000 yards, you’ll enjoy a very generous 393-foot field of view. Unfortunately, the rangefinder’s eye relief falls a bit short for eyeglass wearers, at only 16mm. You can use the diopter adjustment to adapt the eyepiece up to 2 diopters, but that may not help many users. This model, alas, uses the same CR-2 lithium battery that most rangefinders use. This can make finding a replacement battery difficult in the field, so be sure to have a spare on hand. The good news is that the rangefinder makes excellent use of the battery, and you should be able to go about a year before needing that spare. This is a pretty simple and straightforward rangefinder, without many bells or whistles. If you have the red faceplate installed, the device is automatically in slope compensation mode and will give you the true yardage to your target. With the black faceplate installed instead, you’ll get line-of-sight range. The device’s Pinseeker mode, which helps lock onto small targets, is always on, and the rangefinder will vibrate when it has acquired an object. Bushnell’s E.S.P. 2 technology is built in, speeding up the device’s ability to compute the range to your target. What’s the Light Gathering Capability Like on the Bushnell Tour X Jolt Laser Rangefinder? Thanks to the large objective lens and fully multicoated optics, transmittance is quite good on this rangefinder. You’ll be able to easily see targets in low lighting conditions, and the Dual Display Technology allows you to switch between black and red displays depending on your preference and the lighting conditions. One thing to be careful about is the fact that there are two production models of the Tour X Jolt. 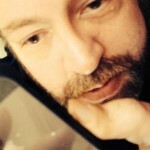 One, manufactured in 2015, has a mirrored lens, which makes the image very dark. The model I received, however, had the black/clear lens, which provides a very bright image with plenty of contrast. The optics are superb, and focus is fast and sharp. Without much delay at all, the image zooms into focus and the E.S.P.2 technology returns your range almost as quickly. The Tour X Jolt has a plastic casing with some rubber trim, but it’s not very shock absorbent. In short, this rangefinder isn’t meant to be abused. The lack of shock absorbency is compounded by the fact that the lenses aren’t O-ring-sealed and the optics chamber is not nitrogen-purged. If you’re looking for a model that’s shock-proof, fogproof and waterproof, this isn’t it. 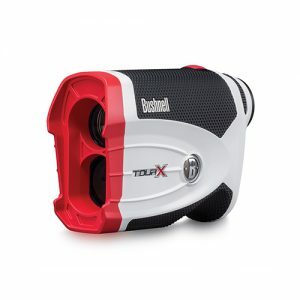 Thanks for reading my review of the Bushnell Tour X Jolt Laser Rangefinder. This model is fine if you don’t mind babying it, since it offers superb accuracy and an excellent view. However, it’s not capable of handling the type of abuse that some hunters subject their rangefinders to. You also have to be careful that you get a model made after 2015, or you might suffer from an extremely dark image in all but the sunniest of lighting conditions.